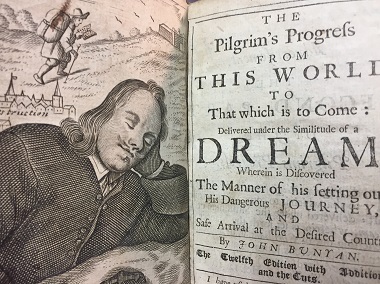 I could hardly believe my luck, getting off the waiting list and into the Uncommon Devotion: Reflections on Puritan Texts conference July 13 – 14. An anonymous donor had made it possible for eminent scholars on the Puritans from North America and England to gather together and offer a couple of days of lectures at Regent College – for free! 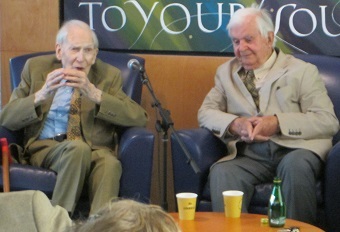 Regent College stalwarts James Houston and J.I. 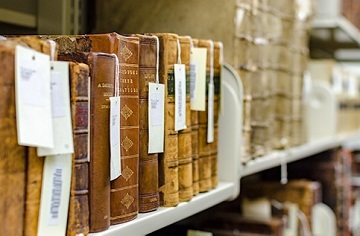 Packer have made donations from their personal libraries; along with other works, the Special Collections room at the Allison Library – downstairs at Regent College – now boasts about 3,000 Puritan books. These rare books are now being digitized with the help of Jacqueline Vincent of Brechin Imaging Services and put in order and tidied up by Jenny-Lyn de Klerk (dubbed ‘Puritan Jenny’ at the gathering, she was hired early last year to boost and build awareness for the Puritan Book Project). The conference was an excellent way to advertise their existence and availability. A recognition of a distinct lack of rigour in my intellectual and devotional life began to grow on me as I listened to the eight lecturers share the essence of a Puritan they were particularly familiar with (many had done doctoral dissertations on their subject). These Puritans had in common an “integration of doctrine and devotion,” persevering in a difficult age (the 1600s) – many spent time in prison, and nearly all were expelled from their pulpits. Right now I am especially aware of “how fitly are the stages set” – the ways in which times of stress and distress are so often lovingly followed by respite and refreshment. And I love “The Second Part,” with its feminine characters and the emphasis on making our journey as part of a company. I have found that companions for the journey are among the greatest gifts of life. While this precedes the Puritan years, Puritans made great use of it, albeit, as illustrated by Paul Lim, with fairly severe editing out of distinctly Catholic elements. In the Special Collections room at Allison Library. The word precision (but not brevity) is often used in relation to the Puritans. Tom Schwanda spoke about Isaac Ambrose’s teaching on spiritual practices from Media (the shortened title). In a personal conversation, he recommended Abraham Kuyper’s (a Dutchman in the Reformed tradition) devotional practices, To Be Near Unto God. Works by New Englander Thomas Shepard appear in three volumes. Introduced by David Hall, they also sound intriguing, and I may start with one of those. They are in the regular stacks at Allison Library. Lee Gatiss’ booklet celebrating John Owen’s 400th anniversary is a good place to get an introduction not only to the Puritan himself but to the times in which he lived. And more! In the open time, in response to a question about what pastors could take back to their congregations, the speakers made a number of other suggestions, including John Flavel’s Keeping the Heart and Jeremiah Burroughs’ The Art of Christian Contentment. James Packer and James Houston have donated their collections of Puritan books to Allison Library. One highlight of the conference was Cindy Aalders’ conversation with Packer and Houston (Aalders played a large part in pulling together the conference in her dual roles as library director and assistant professor of the history of Christianity) about how they came to appreciate Puritans and then to collect their books. Some of Packer’s responses are reflected in his interview with Jenny-Lyn de Klerk, held just before the conference. Well, I think there is something wrong, frankly, if one pursues the Puritans – tries to get a hold of volumes of their writings and so on – when one’s primary concern isn’t personal spiritual growth. My reason for saying that is that the Puritans themselves wrote their material in the first place as ingredients in sermons. A lot of the Puritan works are actually series of sermons, so that you could say . . . that the Puritans preached books. Jenny-Lyn de Klerk interviewed James Packer. Go here for the full interview, and here to visit the Puritan Project website. Many thanks to Regent and the anonymous donor for providing an opportunity to revisit and appropriate these ‘signposts’ for the edification of the church. To this librarian experienced in bibliography and digitization, this project raises concerns about (1) proper care and use of rare books (2) unnecessary duplication of efforts (3) standards of digitization (4) appropriate allocation of resources. A well-written article. Thanks for keeping us informed!